Phoenix Family Foodie Blog: Cal Flame: The Ultimate Back Yard BBQ Island! Cal Flame: The Ultimate Back Yard BBQ Island! When I think of an outdoor barbecue island, I think of a large grill, situated inside some type of brick or stucco, with perhaps a refrigerator and a side burner as accessories. But, consider this...a fireplace, two water features, a fire pit, a smoker, two refrigerators and a fully functional sound system. Sound enticing?! Then take a look at the Cal Flame Master Chef Outdoor HPB Island! "From entertaining guests to relaxing at home, transforming any backyard into the ultimate home resort destination has never been easier. With the Master Chef Island, the grilling enthusiast can cook, cool, store and wow the neighbors with countless hours of entertainment." This was by far the most amazing sight at the Cal Flame 2015 product unveiling. Don't get me LBK870 with side burners and sink, and the practical LBK 830, with plenty of room for food prep and bar stools. Accessories included deep fryers, side burners, pizza ovens and rotisseries. But if we're talking about an all out show-stopper for the event, let's talk about the Master Chef. This island was awarded the Hearth and Home Magazine Vesta Award in 2014 for outdoor room equipment. 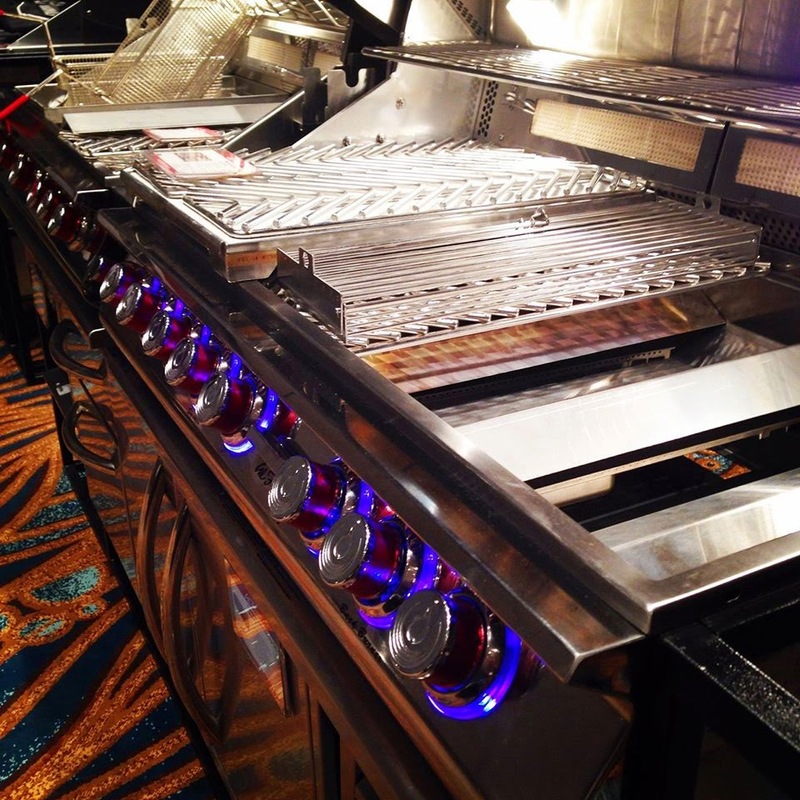 An incredibly prestigious honor within the outdoor barbecue and hearth industry. This baby can do just about anything, including an incredible LED light display on it's bubble frame counter top. Watch the video below to see what we're talking about! Again, this event was SO amazing and full of fun times! Be sure to check out all of Cal Spas and Cal Flame's products, find a local dealer and get YOUR backyard entertainment in full swing!